Since I review a lot of Crossway products here, I should offer a disclaimer. Yes, Crossway is the publisher of my book Rethinking Worldview: Learning to Think, Live, and Speak in This World. So it goes without saying I have a good relationship with them and think they do a wonderful job. But it wasn't always that way. When I first started writing about Bibles, the bulk of my criticism was aimed at the good folks in Wheaton, Illinois. Why? Because I liked the new English Standard Version translation but hated the bindings. That criticism opened a door. Crossway took my feedback in stride and asked for more. In time, they acted on an idea of mine which resulted in the Journaling Bible, and when they found out I'd written a book about worldviews, which is one of their core subjects, they were anxious to take a look. I'm grateful for all that. But it hasn't tempered my criticism. When I like what Crossway's doing, I share it, and when I don't, I share that, too. I didn't make a secret of my lack of enthusiasm over the Single Column Reference Bible, for example -- as much as I want more single-column settings, I don't want to see verse-by-verse rather than paragraphed text. By the same token, when Crossway does something praiseworthy and inventive, I'm going to say so -- and that's my transition to the Daily Reading Bible. IF THIS IS THE SOLUTION, WHAT'S THE PROBLEM? In a word: literacy. One of the things I've learned as a teacher is that Christians don't know their Bibles as well as they should. (And I include myself here.) The only solution is reading, and there are dozens of reading plans out there designed to encourage just that. One that I've always been fond of is the One Year Bible, because it divides the text up as needed and makes following the reading schedule easy as can be. As a result, I've promoted the One Year Bible for years as an easy way to integrate daily Bible reading into a life. There's always been one problem, though. In a nutshell, the One Year Bible is a one-trick pony. It's not the Bible you're going to study from, or bring to church. If you had to look up a particular text, the way everything's divided would make it tricky. So the One Year Bible is something you use in addition to your regular Bible. The Daily Reading Bible aspires to be more -- and less. First, let's look at the less. 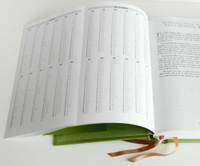 In the front of book, there's a detachable, fold-out reading plan. On one side it lists topical references and on the other it explains what to read when. When I started using the Daily Reading Bible, I found that a little distracting, because I kept having to check the front to see what to read. Then I realized I was using the thing incorrectly. The guide in the front is detachable for a reason. You can remove it from the Daily Reading Bible and use it in any edition. The fact is, you don't need it for the Daily Reading Bible, because there are notes in the text telling you what to read. That's where the "more" comes in. The text of the Daily Reading Bible flows without interruption, which means you could use this as your only Bible, for whatever purpose. It functions precisely the way an ordinary Bible would, there just happen to be marginal notes designed to facilitate daily reading. Also helpful in this regard are three golden ribbons, one to mark each section of the daily reading. If you're a low church Protestant like me, you've probably wondered why prayer books, missals, and other devotional books are packed with all those multi-colored ribbons. They're designed so that the reader can keep track of multiple sections -- in the case of the Book of Common Prayer, for example, you might want to mark the section for Morning Prayer, the relevant portion of the Psalter, and (if you have a Bible bound in) the lectionary reading(s). Most Bibles have a single ribbon, designed to mark your place when following along with a sermon. With two ribbons, you can keep your place in the Old and New Testaments. With three, you can add a marker to the Psalms. It's as simple as that. Because it's a hardback, the Daily Reading Bible opens flat. The form factor is a bit smaller than a pew Bible, too, which makes it handier for reading. I'm writing this on September 24, 2007. Without so much as looking at the fold-out guide in the front of the Daily Reading Bible, I can easily find my starting place by flipping through the bottom margins in the New Testament. (You could do this anywhere, but in the New Testament things are closer together.) On the bottom of page 909, which is the first page of the book of Acts, I find a listing for today. In the side margin next to Chapter 1, there's a SEP 24 note, and all I have to do is read until I hit the note for SEP 25, which is at the start of Chapter 2. At the bottom of the page, I'm referred to today's readings from the Old Testament (Ecclesiastes 10-12) and Psalms (Psalm 78:40-72). Turning to any of the day's passages, I'll be referred to the other two. Not only is this incredibly simple, but it shows how easily such a system could be adapted for use in any edition of the Bible. The notes don't have to be large -- as long as they're there, you're good to go. After a week of using the Daily Reading Bible, I started wishing that the marginal references for the reading plan could be transposed into a Classic Reference Bible. I mean, the system Crossway has developed works extremely well. This is the first thing I've found that seems better and more convenient than the One Year Bible. (The Lectionary falls short only because it doesn't cover the entire Bible.) To me, the Daily Reading Bible notes are the equivalent of marginal references -- once you start using them, it doesn't make sense that they aren't in every Bible. When I tried using the detachable reading plan with my Allan's ESV, I ran into a problem -- not enough ribbons! You need a minimum of three for this to work smoothly, and without them you have to find alternate bookmarks. What I'd love to see in the future is (a) the integration of the Daily Reading Bible guide notes into a Classic Reference Bible -- or better, the upcoming Personal Reference, which has a single-column setting -- and (b) three ribbons to make it all work smoothly. 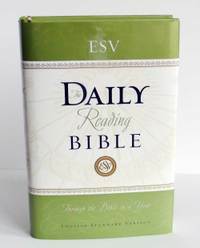 In the meantime, if you're looking for a simple way to stay disciplined in your daily Scripture reading, the Daily Reading Bible is a wonderful tool.